The Peace River - Alaska Highway is a diverse region of Northern BC with mountains, prairies and plateaus. The Rocky Mountain Trench lies to the west and borders the stunning Rocky Mountains. 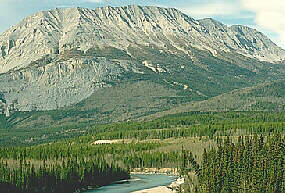 These mountains give way to a gradual slope that leads to the vast prairies on the Alberta border. An abundance of big game such as grizzlies, black bear, deer, caribou, elk and the stone ram are found within this region. Fishing is also very popular in the Peace River/Alaska Highway region, where you will find a variety of game fish such as rainbow and lake trout, northern pike, Arctic grayling, Dolly Varden, mountain whitefish and walleye. There are vast forests, great scenery, spectacular campsites, wildflowers, birds, Northern Lights and abundant history. There's evidence that dinosaurs once roamed in this region, which accounts for the oil, natural gas and coal which are the main resources. Forestry, agriculture and tourism are other important industries. Take the road to adventure and enjoy the Peace River - Alaska Highway route through Northern British Columbia.